There has actually been a steady beat of coverage these past few days leading up to the official start of NCAA basketball season regarding the Eagles. So much of it has been focused on second-year coach Steve Donahue, and the talent he brought in to restock the bare cabinets left by a previous coach who's luck with finding pearls ran out and who never really "coached" much more than let the boys play. There is something to be excited about with the new coach. Maybe not this year, but last year's team nearly surprised itself by making it to the NCAA. But there is a bright future, and if you haven't read the CBS piece yet on Donahue and his leadership, go ahead. I'll still be here when you get back. However, when assistant coach Akbar Waheed asked if I needed a roster, I just laughed. Eddie Odio, KC Caudill, Jordan Daniels, Ryan Anderson, Lonnie Jackson, Dennis Clifford, Patrick Heckmann. First round draft pick has a great ring to it. Getting drafted #24 to play basketball alongside Kevin Durant? Reggie Jackson, first team ACCer, you absolutely deserved that honor. But right now you're sitting in a gym, wearing beautiful BC basketball gear but not because your Thunder warm-ups are in the laundry. I don't fault the guy for getting paid when he saw the light of the first round being a legitimate opportunity. It isn't a surprise, though, that the dispute between players and owners in the league could have cost the NBA all or part of this season. I've gone back and forth on this issue since Reggie announced last spring, but even back then, the lockout loomed. With games really getting canned now, I'm going to question it further. I know this year doesn't look, on paper, to be one we can get excited about to the tune of "Deep March Run." How many more wins could Reggie have been worth? 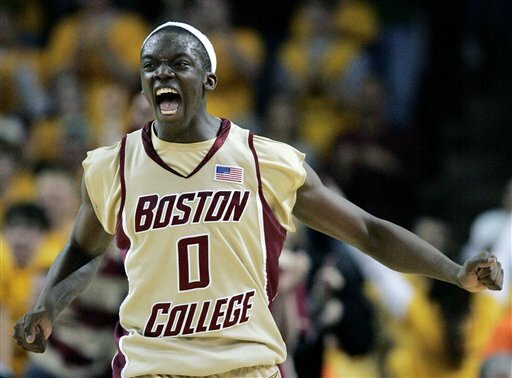 Would he have made enough of an impact this year that BC could have gotten into the tournament? Even more so, isn't there is the opportunity for him to be the teach to that ridiculously young team how to come together. 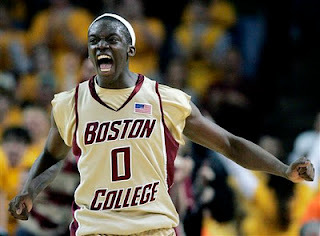 Donahue is making me excited for the future of BC hoops. But one more year with Reggie may have made the wait not feel as long. Imagine Reggie will regret the decision. It would have been nice to have a senior leader to bridge the gap, but I thought something similar with Rice and he definitely did not have a positive impact.